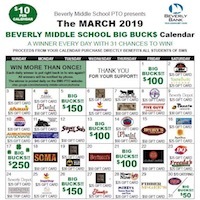 Beverly Middle School Homeward Bound: BIG BUCK$ 2019 – Let’s go BMS!! Let’s go!! Calendars are just $10 each with great winnings throughout the month of March. Your student should turn in the BOTTOM slip from the calendar all filled out with cash or check made out to Beverly Middle School to their first period teacher every day they have them! The buyer should keep the calendar portion! The homeroom in each grade with the most calendars sold by February 14 wins a BAGEL WORLD BREAKFAST! We have not gotten slips from all homerooms!! Let’s go, who will win it this year!!??? IN ADDITION…..the child who sells each winning calendar in the month of March will get $10 cash for themselves! !